This CNLight conversion kit contains everything you need to convert your factory halogen high/low headlamps into HID, High Intensity Discharge. Halogen Hi: This type of kit includes a regular HID bulb for low beam, with a small halogen bulb mounted next to it for the high beam. This high beam will not be as bright as your factory high beam, but it will still be useable to signal other drivers and to provide a basic function for compliance with state inspection. The installation is quite simple, using our exclusive configurable connectors. BiXenon: This type of kit includes bulbs with a moving base and a controller BiXenon relay. It is one HID that moves slightly to create a high beam projection, allowing you to use HID for both low beam and high beam. The installation is slightly more complicated due to the need for the BiXenon relay, but is not difficult. The relay connector also uses our exclusive configurable connectors. We strongly recommend this option if you plan on using your high beams regularly. When installing HIDs in a dual-filament setup, you must use the vehicle's wiring, which is 3 wires: one ground, one high-beam power, and one low-beam power. Since standard bulbs do not require a particular configuration or polarity, auto manufacturers do not always use a uniform configuration. When you plug the kit in, the high beam may come on with your low beam, and vice versa. To solve this problem, we are proud to include configurable connectors with all of our dual-filament kits, making it simple to switch the wiring as needed. The plug and play connectors can be switched in seconds to easily configure the kit for your particular vehicle. The ballasts are the most important component of an HID kit, as they provide the power. After years of providing midrange and high-quality ballasts for vehicles of all makes and models, Diode Dynamics learned what was important in making a good ballast, and applied it when designing these. The bulbs included with Diode Dynamics kits are CNLight bulbs. CNLight is the top manufacturer of aftermarket bulbs in the world, providing the best quality available. You might see other high-quality kits on the market which also use CNLight bulbs. They provide superior life, brightness, and color attenuation when compared to generic HID bulbs, like those found in most cheaper kits on the market. The one-piece base design prevents any issues with seperation over time, making the entire bulb extremely reliable. The bulb temperatures are rated accurately in Kelvin temperature, and have an industry-standard 2500 hours of estimated bulb life, which should outlast your vehicle. 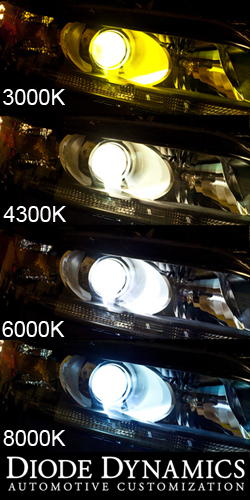 4300K is a pure white output, as seen on many factory HIDs. It will not have any blue tint to its color. 6000K is our most popular color, which produces an ice white color. It has a slight hint of blue, and matches best with our LED bulbs. 8000K is our highest temperature, which produces an ice blue color. Do not be fooled by overrated "lifetime" warranties from other manufacturers and distributors. The warranty is only as good as what the company actually replaces. Our warranty is through Diode Dynamics, LLC, so you can be assured that you will get fast and friendly service should you have any problems. In addition to the 1-year full warranty included with all of our products, your HID kit comes with a limited lifetime warranty. This lifetime warranty covers the ballasts and wiring for the lifetime of your HID kit. We carry our own inventory, so no waiting for them to be shipped from overseas, or waiting on big, unreliable suppliers to ship them. They ship right from our own inventory, in St. Louis, Missouri, usually the same day you order. One pair HID bulbs in your choice of color, and choice of halogen hi or bixenon, with our exclusive configurable signal plugs.